Joe shows how you can recreate a classic. The magazine Radios and Hobbies was the forerunner to Radio, Television & Hobbies (RTV&H), and Electronics Australia (EA). Unlike Silicon Chip, the Radio and Hobbies line always seemed to have a musician on staff, and for a time its editor was both a qualified engineer and keyboardist (hence the first Playmaster, a full console organ). As a result the magazine published more than its fair share of music making electronics. 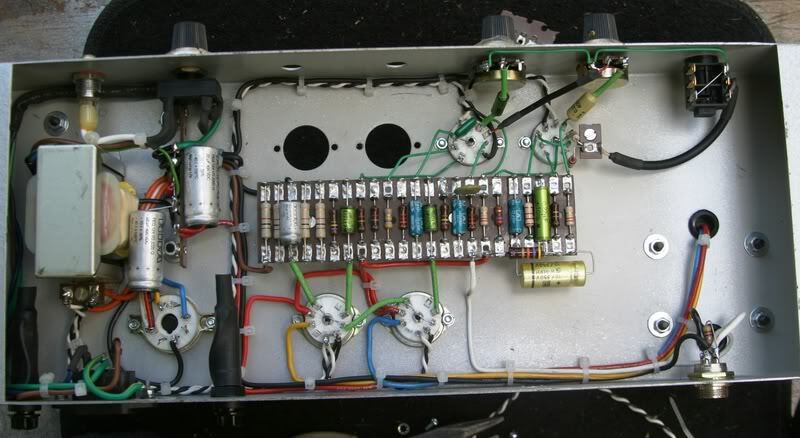 The earliest we know of being an “Universal” or AC/DC design using a pair of CL4 pentodes in push-pull giving 8 watts output into a 10-inch or 12-inch speaker. 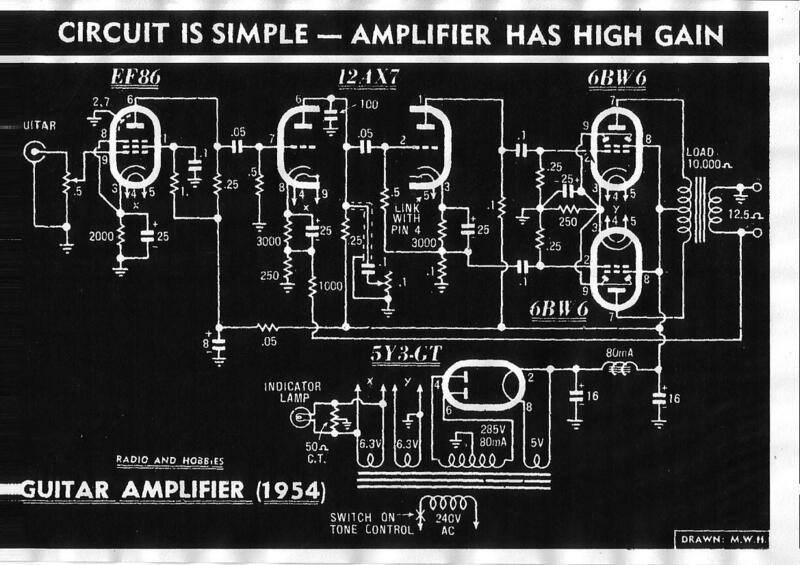 There are some early examples (also on the Playmaster page) but here Joe, better known to his friends by his nom-de-Net as “Ampmangler”, has recreated a 1954 design which uses 6BW6's. 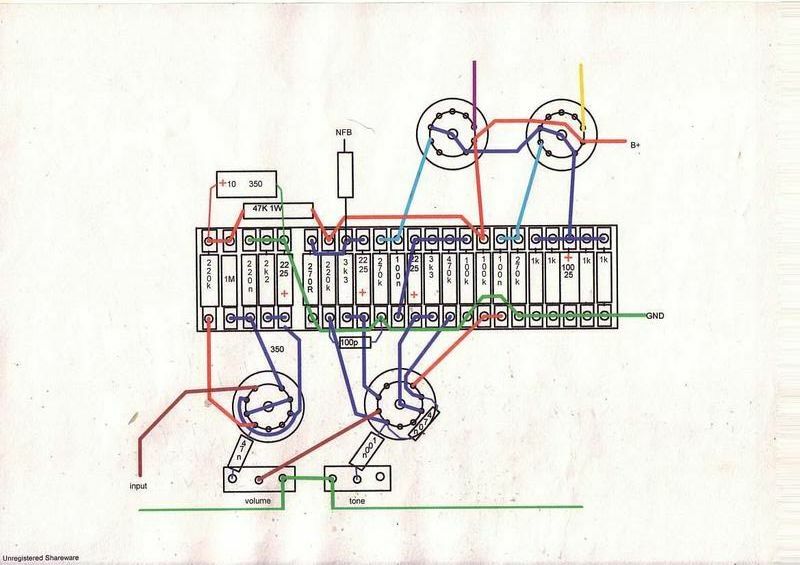 Original circuit diagramme This is in the original dark blue on white format. Joe has pulled all the stops out with this build, but there are a number of ways that you can save money and still have this sort of sound. Perhaps the most obvious are the commercial transformers. 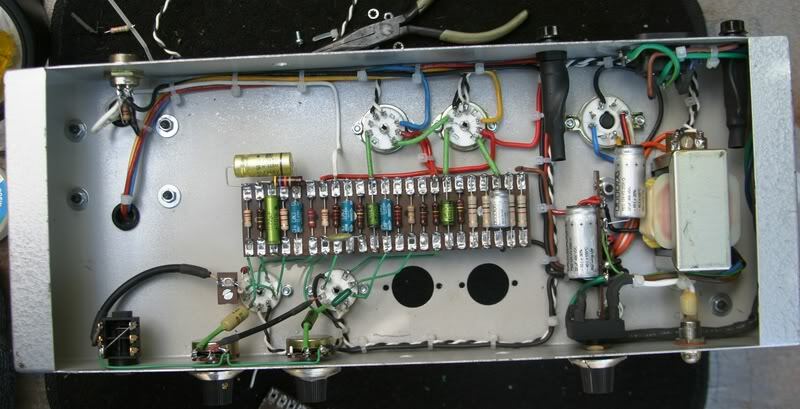 Power supplies and output transformers from the AVA100 theme will work just as well. The entire power supply can be replaced, and an inexpensive 100V-Line transformer will serve for the output transformer. The suggested power switch on the tone control is a bit difficult these days since switchpots have become collectors items, and besides, it's now considered poor practice to mix mains and signal wiring and proper mains switching and fusing is mandatory these days when amps may have to be OH&S tagged for electrical safety to be allowed to gig. I think the following images tell the story.